If you ever have the chance to attend a church service that is conducted entirely in another language, I urge you to take advantage of the opportunity. It is something truly amazing to hear those around you singing praises to God in a tongue that is different from your own. To me, it’s like a little picture of heaven with every tongue and tribe praising God in their native voice. Though it might seem strange to us at first, it is important to remember that God speaks German (not to mention Italian, French, Spanish, Chinese, Portuguese, Hindi, Swahili, and any other language) just as well as he speaks English! (Though I suppose a person could argue that He speaks Hebrew the best, but we won’t go there in this blog post…) My main point is that God is the God of all nations! I feel so blessed to be able to serve him in Germany! Last Sunday, I attended a German church in the neighboring village of Haagen with three other BFA teachers. Even though there is an English speaking church right in Kandern, I wanted my first experience of church in Germany to be at an actual German church. Similar to in America, churches in Germany are entirely different depending upon the denomination, worship style, pastor, and all those other factors that make a church unique. The church that we attended was called “Gemeinde Der Offenen Tür,” which basically means “church of the open door.” True to it’s name, it was a very welcoming environment with lots of friendly greeters…not to mention a coffee/cookie bar. 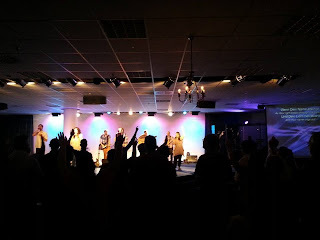 ;) The worship style was energetic and modern—similar to many newer American churches. It was fun getting to sing some familiar English songs with new German lyrics! To help foreigners (like myself!) understand the sermon, the church offered a simultaneous sermon translation. This meant that while the pastor was teaching, I could listen through a headset to a real-time English translation. This was definitely helpful since my German is not nearly advanced enough to understand an entire sermon! About mid-way through the sermon, I decided to take a little break from the headset and see how far my language skills would take me. I did fairly well, but was nowhere near full comprehension. I remember him talking about the story of the boy who shared his five loaves (fünf Brötchen) and two fish (zwei Fische) with the crowd and how Jesus multiplied it to feed over 5,000 people. There was also this example about giving God all they keys of your life (Schlüssel zu Ihrem Leben) and not holding back any keys like the key to your house (Schlüssel zu Haus) or your car (Schlüssel zum Auto). Of course, all of this linked together somehow in a lesson about Barnabas in the New Testament, but I have to admit that my limited German didn’t always pick up on the connections. Overall, it was a memorable experience and I am excited to visit other churches in the area. Sundays in Germany are traditionally a day of rest (Ruhetag). Stores shut down and many people spend the day resting or visiting with family and friends. People typically will not do any type of outdoor/public housework…so no washing your car, mowing your lawn, hanging your laundry, or painting your patio. (Not that people typically paint their patios…but I just thought that I would throw that in there!) People are also expected to be a little more quiet and respectful on Sundays than they would on normal days of the week. Of course, all of this is from the perspective of a small rural town in Southern Germany. I am sure that if you visited the big cities in the north like Berlin or Hamburg, things would probably be a little different. Even though the stores in Kandern are closed on Sunday (make sure to do your shopping on Saturday! ), restaurants do remain open. After church, we decided to stop at the local Döner/Pizza shop. This is where I had my first (and definitely not my last!) taste of a Döner kebab, which is a Turkish flatbread which is basically the same thing of as a Greek Gyro—shaved lamb, tomato, lettuce, cabbage, and a cool yoghurt sauce. So delicious! Love your blogs.....you really know how to write so that your audience is right there with you! As school starts, I hope you're able to find time to continue this wonderful exercise. I'm wishing I was there teaching with you!! And my high school German is coming back...unbelievable!! Wish I could've seen you before you left the USA, but months go by quickly....so I know I'll see you soon.